Pay modernisation: Vote YES for action to defend your pay and conditions! The new contract breaks from national pay bargaining: staff who sign are not guaranteed whatever national pay award may be agreed for 2013-14 or beyond. Staff at the top of their grades may never get another pay rise: the new contract scraps any form of collective bargaining on pay between management and the unions. The new contract breaks from national conditions on working hours: staff on P&M grades (SO1 and above) have no limit to the length of their working week. Management claim the new contract will save jobs by cutting the pay bill, yet there have been more than 540 redundancies across Camden since Summer 2010, while pay for most of us has slumped by 15% in real terms. Some staff who signed up and have worked week day shifts are already being told they will have to work until 10pm and weekends. There is no automatic right to an incremental pay increase. Progress through a zone depends on a ‘good’ (3) or higher rating – and your rating could suffer if you fall ill. For staff on SP grades (scale 6 and below) you will have to be ‘High’ or ‘Exceptional’ for two consecutive years. The performance ratings review process does not allow for union representation. Despite ‘voluntary’ sign up, some face the prospect of being forced onto the new contracts through reorganisations. There is also the threat of mass dismissal and re-engagement of staff. Performance-related pay has been good for some: the number of senior managers paid more than £60,000 has increased by 26% since summer 2010. This can’t be sustained across the board, when the aim is to shave £2-3 million off the pay bill each year for 15 years: up to £750 per employee per year. There have been no formal talks with management since last summer and so far no sign of movement on the key points above. We need a decisive vote for industrial action to bring management back to the negotiating table. If we don’t resist these cuts to our pay and conditions now, it will be an open invitation to slash Council spending still further at our expense. For now annual pay and maternity/paternity entitlements are intact, but for how much longer? If you haven’t signed the new contract vote YES for action to defend your pay and conditions. 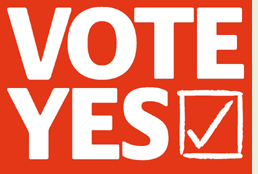 If you have signed the new contract vote YES for action to improve your pay and conditions. The ballot ends at 4pm on 22 April 2013. For more information, talk to your local representative, see here on our website or call the branch office on 020 7974 1633. Please be aware that this is not an official strike ballot, which would only follow at a later date. Most members should receive this ballot electronically by e-mail. If we do not have an e-mail address for you on our system, however, you will be sent a paper ballot. If you would prefer to receive email communications from us in future, please update your details on-line through this website or email paul.england@camden.gov.uk. If you have not received your ballot paper by Friday 12 April please contact the branch office to make sure you get one.